Windows 10 launches on July 29: What happens next? The hype machine is gearing up with Microsoft Corp. set to release the latest version of its flagship OS, Windows 10, on July 29. What does that mean for you though, and what will happen to your PC on that fateful day? The simple answer is, it depends. What happens will vary depending on whether you’re using a personal PC or one on which you have full administrative rights, or whether you’re on a company-issued device that’s locked down by your corporate IT department. If you’re in the latter group, you may be waiting a bit before you see Windows 10 live and in person. If you control your PC, you’ve probably already seen a pop-up from your taskbar generated by Microsoft, informing you that Windows 10 is launching July 29 and inviting you to reserve your free copy. 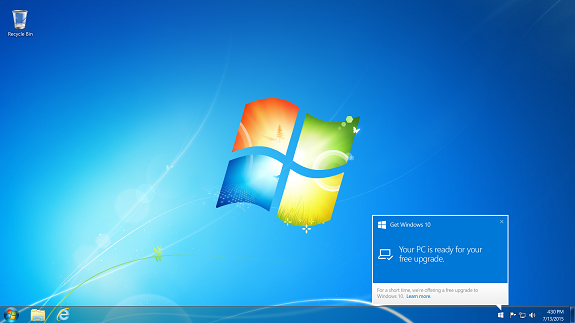 Come July 29, Microsoft will confirm whether or not your system is compatible with the new OS. If it is, you’ll be invited to download the upgrade. If your system isn’t compatible, you’ll be informed what the issues are and offered advice on how to address them. You may also be able to override the concerns and proceed with the upgrade anyway. For users in a business context where the PC is managed by the IT department with administrative rights locked down, the timeline for moving to Windows 10 is out of the user’s hands – it’s up to the IT manager. If the business purchases a Windows license with each PC, much the same way a consumer does, the process is similar and the upgrade can happen at any time after July 29. However, most business use volume licensing, which sees businesses pay an annual fee for the number of licenses they have active in their organization. Windows 10 Pro will be available for volume licensing customers to download from the Volume Licensing Service Center on July 29, and Windows 10 Enterprise and Windows 10 Education will be available Aug. 1. Watch for this pop-up on your screen beginning July 29. However, just because Windows 10 will be available doesn’t mean it will be making its way to your corporate laptop soon. A business upgrade is a very different proposition than an upgrade in the consumer context. While Microsoft is running compatibility checks, most major businesses will also need to run their own compatibility testing programs to ensure all the applications the business relies on, including some that may have been custom-developed for the organization, are compatible with the new OS. This testing can take time, and may not be at the top of the priority list for many overburdened IT teams. If past upgrade cycles to Windows XP and Windows 7 are any indication, many businesses take a wait and see approach to see how stable the new OS is before they upgrade their inventory. While Windows 10 is more of an incremental upgrade than past OS refreshes and Microsoft’s new “as a service” model for Windows should make for smoother upgrades going forward, businesses will still want to make sure they have their ducks in a row before pulling the trigger. The good news is that Microsoft’s own testing is showing some very strong compatibility figures. According to Terry Myerson, executive vice-president of Microsoft’s Windows and devices group, most modern Windows users shouldn’t have any issues. “In our testing of millions of systems, we’re seeing full compatibility today with the vast majority of Windows 8x and Windows 7x systems– and we are not yet done, we will never be done – we will be continuing this application and device compatibility work every day as part of our ongoing commitment to Windows as a service,” write Myerson, in a blog. So if you’re anxious for Windows 10 and you can’t do the upgrade yourself, you’ll want to ask your IT team what their upgrade plans are. In our testing of millions of systems, we’re seeing full compatibility today with the vast majority of Windows 8x and Windows 7x systems– and we are not yet done, we will never be done – we will be continuing this application and device compatibility work every day as part of our ongoing commitment to Windows as a service.